Marianne Dickie, has worked extensively in the migration field since 1993. She is a qualified migration agent, was a board member of The Rehabilitation Unit Survivors of Torture and Trauma at the Mater Hospital in Queensland from 1995 to 1996, and worked as immigration adviser to the Australian Democrats from 1998 to 2004, tumultuous years for Australian migration law and policy. Marianne became skilled at Senate Committee inquiries, and ministerial submissions during this time. Marianne continues to work with the community providing pro bono migration advice. In 2008 she began the only pro bono migration advice clinic in the ACT. The clinic continues in 2016 under the Auspices of Legal Aid ACT. 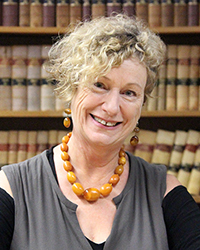 Marianne worked with the Graduate Certificate in Australian Migration Law and Practice from 2007 - 2015 as the Associate Convenor, Convenor, Subdean and Director. The Program is a great success for the ANU regularly recording the highest satisfaction rating from students for any post graduate program in law across Australia. She is currently a senior academic and stream convenor for the Master of Laws Migration Law . Marianne holds Masters in Higher Education and is undertaking a Doctorate in Professional Studies Research. She continues to research and write in her two areas of passion, education and migration. Marianne has won recognition for her work from both the ANU and the broader community. She was the 2012 ACT Finalist, for the Australian of the Year Local Hero, for human rights advocacy. In 2011 she was awarded the ANU International Women's Day Award , in recognition of 'inspirational role as sub-dean'. Marianne was presented with the ANU Media Award 2011 Best result from a Media Release (Ball is in the High Court for asylum seekers). In 2012 the Migration Law Programthe won the ANU Vice Chancellors special commendation for Programs that Enhance Learning. In 2014 the pro-bono migration law clinic was awarded the Community Practice Award from Aids Action Council Act. The Australian government has introduced legislation that seeks to permanently ban asylum seekers and refugees who arrived by boat from entering Australia. The political fortunes of one of Australia’s most controversial politicians, Pauline Hanson, were revived in the 2016 federal election. Marianne Dickie goes behind the spin to look at what’s really happening in migration policy. The inquiry into a certain maritime incident was riveting, the final report a gripping expose of deliberate manipulation of the facts writes ANU Law expert Marianne Dickie. Redefining what it means to be "Australian"
Linkage Grant. Linkage Grant. ANU College of Law Migration Law Program and Migration Institute of Australia, Peer supervised practice. Alan Freckleton, 2015, Administrative Decision Making in Australia, Marianne Dickie (eds), ANU eTEXT, Canberra, Australia. Dickie, M and Van Galen I, ‘Navigating our Threshold Concepts to Enable Students to Overcome Theirs’, in R Land, J.H.F Meyer and M.T. Flanagan (eds), Threshold Concepts in Practice, (Sense Publishers, forthcoming 2015). Marianne Dickie, ‘Navigating our Threshold concepts to enable students to overcome theirs’ (Refereed Paper presented at Threshold Concepts Conference, Durham,10 – 11 July 2014). Book review for the Journal of International Law of Peace and Armed Conflict; Ruhr-University Bochum- “The Refugee Convention 50 Years on: Globalisation and International Law”, edited by Prof Susan Kneebone 2006. Senate Standing Committee on Legal and Constitutional Affairs, Parliament of Australia, Inquiry into the Migration Amendment (Visa Capping) Bill 2010, Canberra 2010. Joint Standing Committee on Migration , Parliament of Australia, Inquiry into Multiculturalism in Australia, Canberra 2011. Senate Standing Committee on Legal and Constitutional Affairs, Parliament of Australia, Australia’s agreement with Malaysia in relation to asylum seekers, Canberra 2011.